Most of my posts about simple living are now part of the Simple Living Toolkit email series which you can get by signing up at SimpleLivingToolkit.com. The free email series kicks off with the 10-Day Decluttering Challenge, which is what is sounds like: an email a day for 10 days, each with one simple task to help you declutter for more joy. After that, you'll get a weekly email advice article from me to help you maintain your joyful minimalist lifestyle. This new website will help me better serve those of you interested exclusively in minimalism, which has sometimes been a topic here. I list some great free resources on the site, and my books and courses on minimalist living will be available for purchase there as well. Packing Lust will continue to be a place where I blog on travel, packing lists, minimalism, the writing life, and my personal/family life. However, most of my writing about simple living and minimalism is part of the free email series over at SimpleLivingToolkit.com. Questions? Put 'em in the comments and I'll answer them there too. According to a Wall Street Journal article published October 23, 2014, the best day of the week to buy a plane ticket is now Sunday, when prices tend to be lower. According to the Airlines Reporting Corp, you'll find the lowest price for a domestic ticket 57 days before departure, while you'll want to purchase your ticket for an international flight 171 days before departure for the best price. Those are specific numbers. You win by being an above-average planner and counting back from your intended trip dates to get your ticket on the cheapest day. I love this tip from one of my international traveler friends. She suggests taking pictures of souvenirs instead of buying them. Next time you're shopping abroad, pause before you hand over your cash. Take a picture instead. I snapped the top photo in a crazy flea market in Hollywood, California. This photo reminds me of the visit and takes up less space in my home than if I'd brought home one of those carafes, kettles, or bowling pins. If you buy souvenirs as gifts, instead have someone take a nice photo of you standing in front of a landmark and give that away instead. Simplifying your job increases productivity, effectiveness and achievements. And guess what? Simplifying is exactly what will help you land that promotion or get a salary increase. When I first came to Australia I had one suitcase full of cloths and toiletry. Since I arrived (in 2006) I moved 5 times and like most people, each time I took the opportunity to throw away “stuff” I wasn’t using any more, to declutter and prepare for a fresh home. Still, each time I had more boxes to move. It’s similar in our career. Our first job is very straight forward and (most of the time) we don’t have high expectations and stress. As we climb the ranks, we have bigger teams, projects, more responsibilities and are faced with more politics. This goes often hand in hand with longer working hours and more stress. Each time we gain a new role and we increase our responsibilities, we automatically increase the expectations we have of others and ourselves. When it becomes too much and we feel overwhelmed our performance will start to decline, our health will go backwards and, more often than not, we'll be in a bad mood all the time. All of which will create more stress and unhappiness. Just like when you move house, once in a while, you need to declutter and throw away what doesn’t serve you anymore in your career. You have gained more roles, and with that greater responsibilities and expectations and to manage them as effective and efficient as possible you need to re-balance. I believe a simple and effective way to start balancing your life again is to simplify as much as you can. Open calendar (and closed door) policy. To make sure you don’t get distracted all the time you need to make yourself less accessible to everyone. Ask your team members to book a time with you to discuss their problems and challenges instead of disturbing you every 5 seconds. Set boundaries – decide how much time and energy you spend on specific task. Clean – have a clean work space. Make time for yourself. Take does lunch breaks! You need to simplify from the inside out: your thinking, your decisions and your actions. Making time for yourself will give you clarity to do so. One task, one focus - try to avoid too much multitasking; it often creates “starts with no finishes”. Create an efficient system or routine. Have a “one pager:" a business plan, sales plan, life plan, goal plan etc. Make it one page (or a one page summary) – much easier to follow and to keep with you. Don’t complicate if it’s not necessary; choose the easiest way when possible and appropriate. Caroline De Kimpe is a career transformation coach for men and women who have a corporate job and want to break out of their rut and transform their ordinary job into their dream career. Visit her website here. 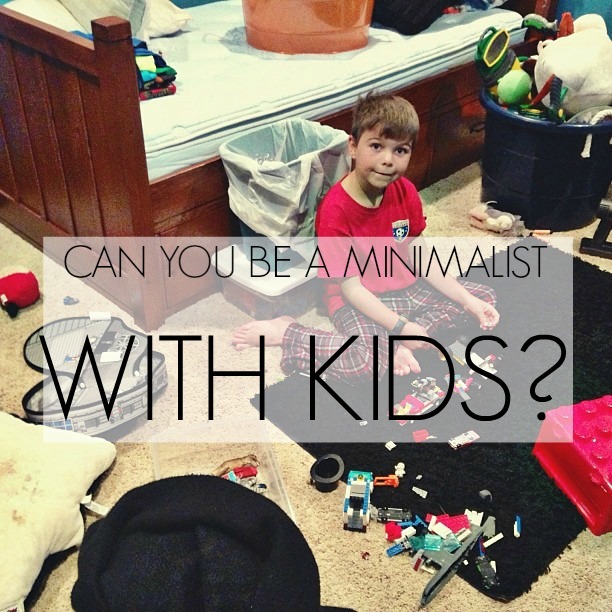 Can You Be Minimalist With Kids? Or is your house destined to look something like this during your child-rearing years? Since publishing my book, Minimalist Living, and a few times pre-publication, I've gotten questions about how to live a minimalist lifestyle if you have kids. I didn't get into that topic in the book because a) we don't have kids yet and b) people willing to say they are successfully living a minimalist life with kids are few and far between. From everything I've heard, the results of procreation are unpredictable. There's no way to know if you are going to give birth to neat-freak matching-sock-wearers, or if you are going to have a bunch of aspiring splatter artists. And if it's the latter, I'd be the last to tell you to crush their artistic dreams. So let's turn to a minimalist parent who can speak to this mystery. I'm publishing portions of an email she sent on the topic. Thanks so much to this anonymous parent who wrote the following. Our situation over the past few years has really necessitated that we keep the clutter down, but I don't know if we would be good at it otherwise --We have dealt with three overseas moves for one-year positions, and each time we've mailed maybe one or two boxes mainly of [my husbands] books and papers, and everything else we brought had to fit into suitcases. We were always moving into furnished places, so they came stocked with just the basics-- dishes, cooking things, bedding, towels, so we were bringing clothes, things we needed to work, like laptops, and a few favorite toys for the kids. If we were in Europe coming back to the US or Canada, we also brought lots of books in German or French, as they would be hard to get here, and we want to keep up the kids' language skills. I have to admit that we never really mastered packing light after we had kids. Once or twice, when it was just the two of us, we traveled to Europe for a couple of weeks with just a regular-sized backpack each (the school kind, not the camping kind), but for our longer stays with the kids, we brought as much luggage as was allowed without being charged extra, and it was always a disaster because it was more than we could carry and especially tough to get on and off of trains when traveling from the airport to whereever we were living, especially when dealing with 3-4 small children, always a stroller, and once with both one in a stroller and one in a baby bijorn. But it always made us realize that once there, we really couldn't accumulate any more stuff since there would be no room to bring it along, but I found I have really enjoyed minimalist living, and having less toys and kid stuff does mean less trouble cleaning up. Now, we are still in a temporary situation, but instead of the furnished rental places that were our last three places to live, we are renting a home from a family on sabbatical, so much of their stuff is still in the house, (which they've lived in for years as the three kids have grown up), including so many toys--it's impossible to keep up with it! In contrast, from 2010-2012, my kids' main playthings were a bunch of duplo legos and some small stuffed animal toys. But it was always enough to keep them entertained-- everyone liked to build things with the legos, and there were enough of them that everyone could have a project at once if they wanted. Usually the boys would build vehicles and then play with them. My older two children (now 9 and 7, but when we first moved in 2010 would have been 4 and 6), had about 4-5 beanie-baby sized animals and liked to act out imaginative stories with them, narrating their actions. Those two activities, plus reading and coloring made up just about all of their indoor activities and was really all that was needed. Now that we have the use of the extra toys, they get strewn about, but not really played with as much. Gift-giving times like Christmas and birthdays are hard because I really want the kids to get to open gifts they are delighted with, but I dread having the extra stuff. Foreign-language books (and movies) are always worth it, so that they could keep up with their language skills, we felt they were worth stocking up on (and probably took up most of the luggage space on this last move). I always try to think in terms of consumable gifts, like arts and crafts supplies, or things that are so inexpensive we don't mind leaving them behind. If the grandparents are visiting for Christmas or something, I also give them strict instructions about what they're allowed to bring as gifts, and I always try to send them back with as much stuff as they bring-- for example, clothes that can be handed down to another kid or books we can save for later. I guess this doesn't really help someone in a situation of living somewhere permanently and wanting to control clutter-- they wouldn't be forced to give it up at the end of the year. Based on my experiences, my advice would have to be, "Once a year, get as many of your possessions as you can into one suitcase and one carry-on per person, and get rid of the rest!" but that's pretty impractical, and I'm sure I wouldn't do it if I weren't forced to. But I think I have probably become a lot more thoughtful about things I acquire, thinking ahead to what are we going to be doing with this thing a year from now -- do I really need it? When doing big clean-ups, I have to chant, "when it doubt, throw it out!" I think I tend to want to be a pack rat and save things, so it can be liberating to know you have to throw things out. My husband really wants to save every bit of artwork the kids produce - so much for the "consumable" art supply gifts! But really, all the pieces worth saving can fit into a large envelope. We just don't buy a lot of stuff (it's not really in our budget to, anyway), and I instruct Grandma not to, though it's hard for her! When we lived with no car, we could walk anywhere we needed to go most of the time because [it]was such a small town, but something like a Wal-mart was a drive away. So if I needed something that would usually call for that kind of store, I'd first check out the local Salvation Army Thrift Store, which had a decent selection and the things there were pretty nice (I checked out the one near where we presently live, and things were not so nice!) -- for instance, I picked up an iron and ironing board for probably under $10 total, so it wasn't difficult to donate it back to the thrift store when we had to move. Anyway, I had the younger kids with me all the time, and the thrift store also had toys, and my daughter would always pick out some stuffed animal that she badly wanted-- a large unicorn for instance, and even though it was only $1.99 or whatever. I'd say "no, we don't need that" realizing that it would become a precious friend that couldn't be left behind but wouldn't fit in a suitcase, and I'd feel pretty relieved that I had a good excuse not to have to bring the thing home. But on two different occasions, kindly grandmotherly types overheard, felt sorry for her, and came up and gave my daughter the money so that the poor girl could buy herself the huge unicorn or horse or whatever. Noooooo! We solved the problem at moving time by having a little girl friend of hers adopt them and promise to take good care of them, so it all worked out-- she got to have a couple of months of playing with them, and it wasn't so traumatic to part with them. So, to those of you with offspring in their younger years, what do you say? Is it possible to live as a minimalist? Let us know in the comments, and PLEASE share any tips that have been helpful to you in this area (even if you aren't perfect or even close ;). For more on this topic, join the free 10-Day Decluttering Challenge and associated minimalism email series.